Step 1: Enable the Translation module. Translate the main navigation and other navigations. Translate the taxonomy terms: menu categories and nutrition types. Translate the content: menu, blog posts, events and locations. Translate the views: links in main navigation, featured events, news and blogs. Open Restaurant has built in support for multilingual. Follow the guides below to add a new language to your site and learn how to translate content. The Translation module will be available as from version 2.1.1. Enable the Translation module under Open Restaurant at /admin/modules. This will install the required multilingual dependencies and set up a few default configuration. Once the Translation module is enabled, go to Configuration ⟶ Regional and language ⟶ Languages (/admin/config/regional/language) and click on + Add language to add a new language. Once the language is imported, go to Configuration ⟶ Regional and language ⟶ Content language and click save. 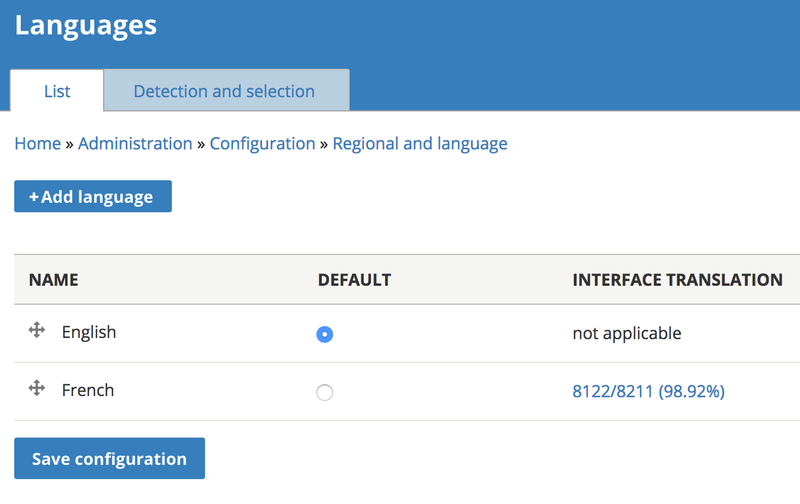 Go to Configuration ⟶ Regional and language ⟶ Configuration translation (/admin/config/regional/config-translation). Click on translate next to System information. Click on Edit next to the language you wish to translate to. Translate the site name and slogan. Go to Structure ⟶ Navigation ⟶ Main navigation (/admin/structure/menu/manage/main). 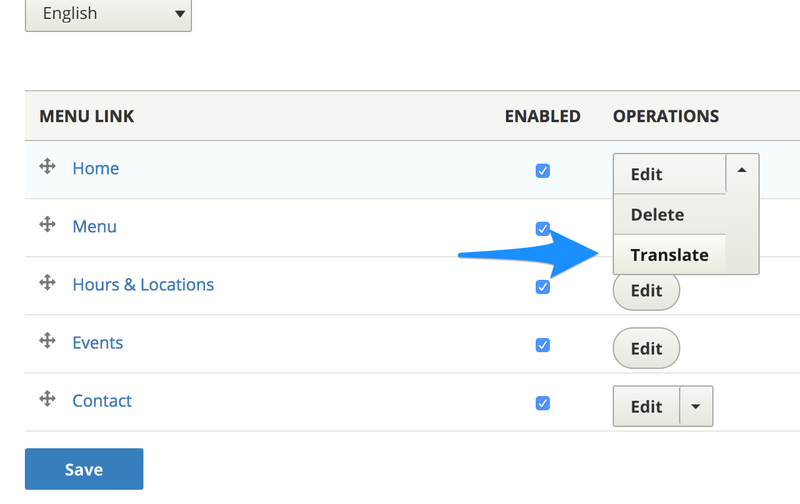 To translate custom menu links such as Home and Contact, click on the dropdown under Operations and click on Translate. To translate menu links provided by views such as Menu, Hours & Locations, Blog and Events, see the Translate the views section below. Go to Structure ⟶ Block Layout ⟶ Custom block library (/admin/structure/block/block-content). Find the block you need to translate, click on the dropdown under Operations and click on Translate. Click on Add next to the language. Translate the block by adding values for the fields. Make sure the translation is published by expanding the Translation fieldset and checking This translation is published. Go to Structure ⟶ Taxonomy ⟶ Menu category (/admin/structure/taxonomy/manage/menu_category/overview). Find the category you need to translate, click on the dropdown under Operations and click on Translate. Translate the category by filling the translated values in the fields provided. Go to Content ⟶ Menus. 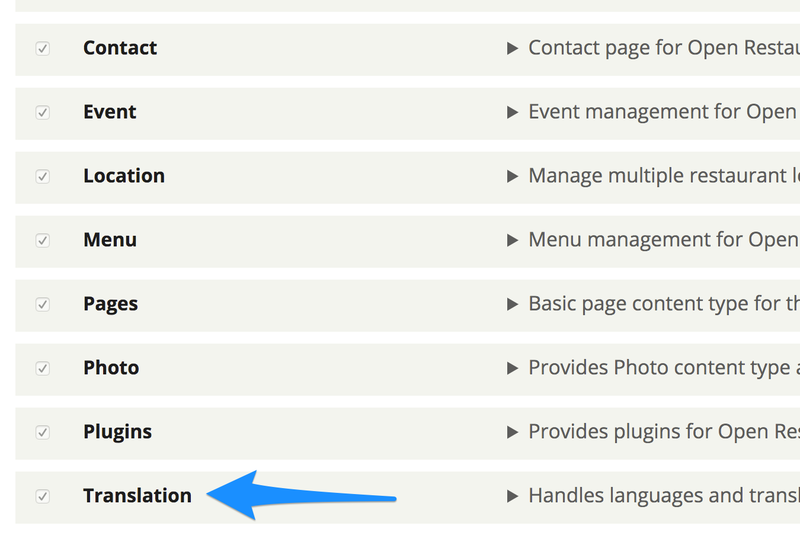 Find the menu you need to translate, click on the dropdown under Operations and click on Translate. Translate the menu by filling the translated values in the fields. You can also upload a different image for the translated menu. Follow the same steps as above to translate the blog posts, events and locations. Most of the content inside these views are handled by translation the content as shown above. Follow the steps below to translate the header and footer text. We will use the Featured blog post as an example. Click on List next to View. Click on Translate next to the Blog Posts. Click on Edit next to the language. To translate the menu link, expand Displays ⟶ Page Display settings ⟶ Page display options ⟶ Menu. Add the menu title under the title field. To translate the Featured blog post header and footer text, expand Displays ⟶ Featured blog posts Display settings ⟶ Featured Blog Posts Block display options. Add translated header and footer text to the fields provided on the right.